This product was designed to fill all of those "I'm bored" moments throughout the summer! 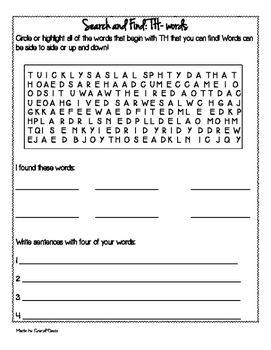 The pack includes 9 math activities, 9 grammar/spelling activities, 9 writing prompts, and 9 ELA activities. 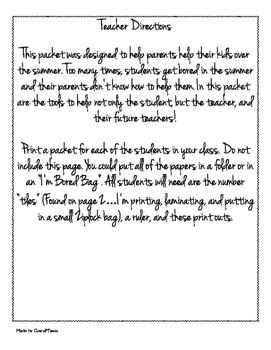 It also includes parent directions. 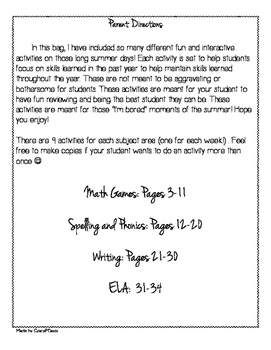 These activities are not meant to be dreaded summer homework, but allows students to review in a fun game-like way! I plan to get a colorful gift bag, put a packet in it, a wooden ruler (one of the math activities is a measurement game), and a jump rope or chalk (just for fun). I'm going to label them as "My I'm Bored Bag" as their summer gift! 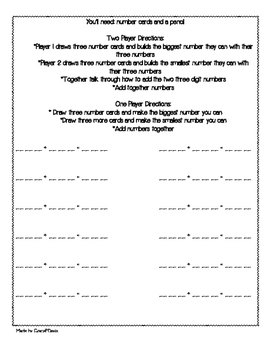 It serves as a fun and educational gift that will help the student, parent, and their future teachers!